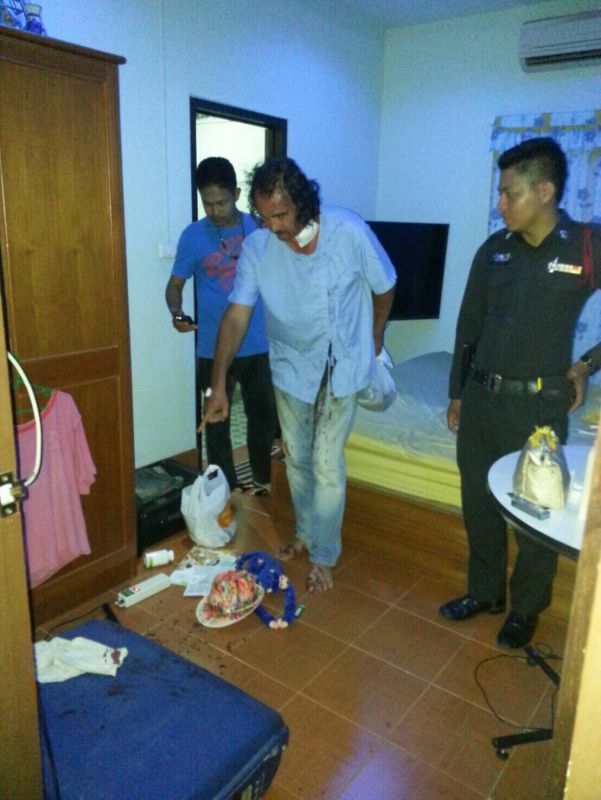 PHUKET: A German man in Phuket escaped with his life after his 38-year-old girlfriend stabbed him in the neck with scissors after she returned home early this morning (Apr 27) to allegedly find him with another woman. The girlfriend, Namphueng Munkerd, told police it was an act of self-defense. 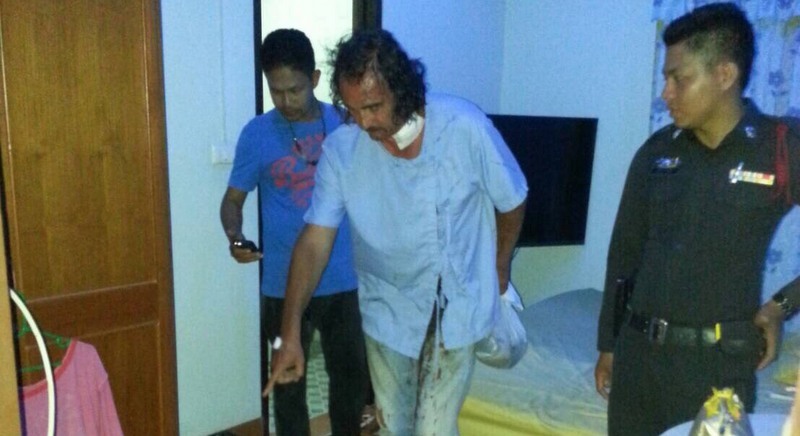 Axel Bernd Dannheimer, 56, arrived at Karon Police Station at 2am covered with blood to file a complaint against Namphueng, an Utthradit native whose name means “honey”. He accused her of attacking him with scissors while he was asleep at their rented home in Soi Patak 14. Mr Dannheimer was taken to Patong Hospital shortly after while a team of officers led by Lt Col Asol Jiraksa launched a search for Namphueng. The search was short. She was waiting at the couple’s rented home when officers arrived. “There were traces of blood on one of her wrists and on scissors that we seized from her. She is facing a charge of assault causing injury,” said Lt Col Asol. According to Mr Dannheimer’s statement to police, Namphueng came home drunk and stabbed him in the neck with scissors while he was sleeping. “My neck was bleeding and I ran out to neighbours and called for help,” he said. Namphueng told police that she had been living with Mr Dannheimer as husband and wife for five years. “She said that she and Mr Dannheimer went out drinking, but he came home first,” said Col Asol. “She said she got home 20 minutes after him and found him with another woman. She admitted she was angry and jealous and they got into a fight. “Ms Namphueng also claimed that Mr Dannheimer pushed her, so she grabbed whatever was nearby for protection,” he added. Namphueng was taken to Karon Police Station for further questioning, Col Asol confirmed. “After treatment for his injury, Mr Dannheimer was released from hospital this morning” he added. Lowlife...all of them. What a pathetic existence. They all deserve each other.